Enable ultra-fast backup, editing, and file sharing, and significantly reduce the time to complete key tasks on select HP Z Workstations with the HP Thunderbolt 3 PCIe 2-port I/O Card driven by Thunderbolt 3 technology. 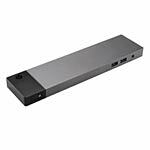 The HP Thunderbolt 3 Dual Port PCIe I/O Card is compatible with the HP Z4 G4, Z6 G4 and Z8 G4 Workstations. Genuine Windows 10 Professional 64-bit, available dedicated PCH PCIe slot.